BiBO crystal features a large effective nonlinear coefficient, high damage threshold and inertness to moisture. In particular for frequency conversions of ultrafast pulses to the wavelength range of violet/blue/green, its effective nonlinear coefficient can be 1.5-2 times higher than that of BBO crystal and 3.5-4 times that of LBO crystal. BiBO products on this page are thin crystals (T =< 3 mm) developed for applications with femtosecond or picosecond lasers. For thicker BiBO products (T > 3 mm) please go to Thick BiBO crystals. Single-band, dual-band or broad-band AR coatings on BiBO crystals are available upon request. 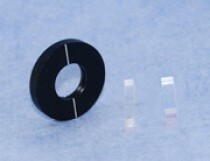 For customer convenience thin crystals ( length =< 3 mm) are mounted in a standard 1" anodized aluminum (Al) mount. Thick crystals can be mounted in a 1" holder upon request. The mounted crystals may be further mounted in a conventional 1" mirror mount to be angle tuned for phase matching ( mirror mounts and posts are not included ). The susceptibility to moisture of BiBO is very low. However, users are advised to provide dry conditions for both use and storage of BiBO to prolong the lifetime. Water condensation on crystal surfaces should be absolutely avoided at any time. Dust and stains on crystal surfaces can cause scattering/loss of light and can even react with light to damage optical surfaces at a high incident laser power. You can inspect the crystal surface for dust and stains by holding it near a bright visible-light source. Viewing at different angles helps to see scattering from dust and stains. The crystal surface has to be cleaned if dust and stains are found. You should perform the following cleaning procedures in a clean, low-dust environment while wearing powder-free gloves or ﬁnger cots. A canister of compressed N2/clean air or a blower bulb (http://www.adorama.com/GTRABS.html ) should be first used to blow off dust and other loose contaminants. If a dry nitrogen line is available in the lab, an air gun can also be used to blow away dust particles. Blow off the surface gently. Do not blow off the crystal itself from your hand ! Hold the crystal so that the crystal surface is horizontal and slightly above your fingers. Take a fresh, clean sheet of lens tissue and place it on the crystal. Make sure the lens tissue can be drawn across the crystal surface. Next place a small drop of pure isopropyl alcohol (IPA) on the lens tissue on top of the crystal surface. The weight of the solvent will cause the lens tissue to come into contact with the crystal surface. Slowly but steadily drag the damp lens tissue across the crystal surface being careful not to lift the lens tissue off of the surface. Continue dragging the lens tissue until it is off of the surface. 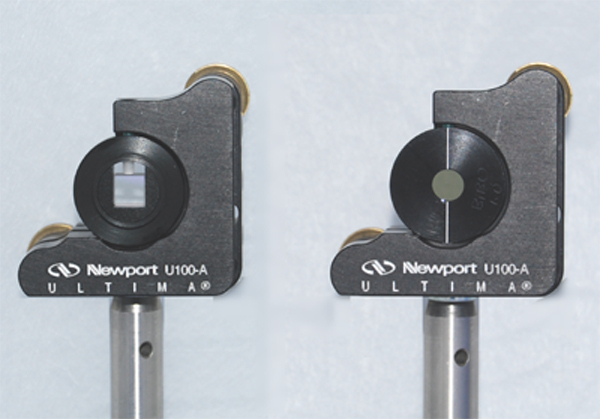 The amount of the solvent can be adjusted for various crystal size so the lens tissue is kept damp for the entire drag but there is not any visible trace of solvent on the crystal surface after the drag is finished. Inspect the surface and repeat if necessary, but only use each sheet of lens tissue once. If the crystal surfaces are still “dirty” after the above cleaning procedures, the surfaces might have been damaged. Please contact us for rework of the crystals.